The 4th of July is fast approaching, and while you might be all set to check out the sights, celebrate freedom, and meet up with your friends at some of the coolest apartments in LA for some delicious barbeque, we all know the “crown jewel” of the holiday will be the impressive fireworks displays. No 4th of July celebration is complete without them, and across the LA area, there will be plenty of spots to pick from if you like to watch colorful, controlled explosions illuminate the sky. Which should you add to your list? That’s exactly the question we’ll be tackling today. Keep reading, as we explore some of the most thrilling fireworks displays across LA that are coming this summer. In LA, the summertime spirit takes on a kind of life that you won’t find anywhere else in the country, and this fact is reflected by the massive, almost otherworldly fireworks displays you’ll find around town. Here are just a few that might pique your interest. Head over to the Rose Bowl Stadium in Pasedena around 2PM, and you’ll be treated to the “patriotic celebration of all things red, white, and blue” that is AmericaFest. This event is known across the country for its thrilling display of amazing fireworks, which begin at 9PM, but that’s not the only reason to attend. There will be plenty of all-American cuisine, a motorcycle stunt show, kid-friendly games, and more for you and the family to enjoy. For a firework fiesta right in downtown, Grand Park and the 4th of July Block Party will be your destination of choice. It’s free to attend (which is always a great selling point), but beyond that, you’ll be treated to an array of festivities to make your time at the park worthwhile. There will be delicious food by way of some of LA’s most notable food trucks, the sultry sounds of live musicians, a friendly, alcohol-free (but dog-friendly) environment, and, of course, huge nighttime fireworks for your viewing pleasure. Do you like being near the beach while the fireworks are sparking? Then the 4th of July Fireworks Celebration at Marina Del Ray will be the place for you. Head over to the west side of the city and you can spend the day picnicking in the park, enjoy a lovely meal at any of the fine establishments along the waterfront, then watch the sky light up from 9:00PM to 9:20PM. 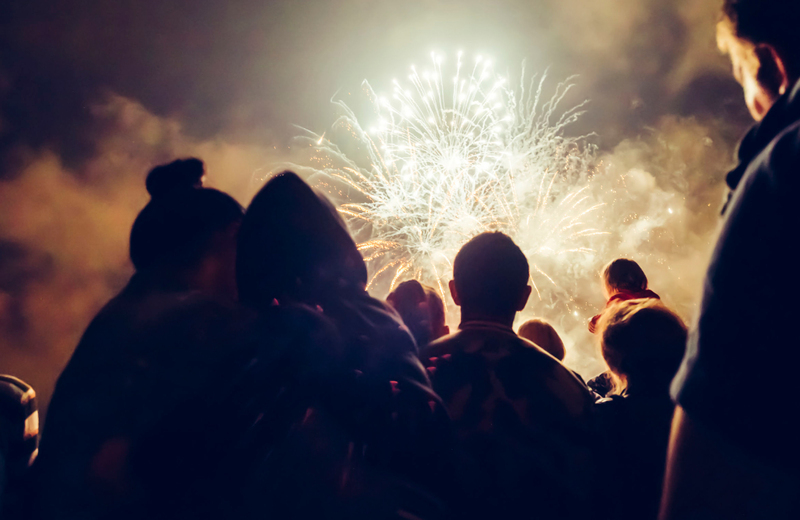 For the most riveting experience, you can view the fireworks from either Burton Chace Park or Fisherman’s Village, where you can watch the fireworks while simultaneously listening to some synchronized live music. Any event that kicks things off with a free concert and festival is off to a good start, and the LA Coliseum’s Annual 4th of July Fireworks Festival has that “box” checked off in stunning fashion. Taking place at 11:00PM in Exposition Park will be the concert, filled with an all-star lineup of performers. LA City Councilmembers Curren D. Price Jr. and Marqueece Harris-Dawson will also be in attendance. The festivities (which include food, games, and family-friendly excitement) will conclude around 10:00PM with a 45-minute fireworks show at the LA Memorial Coliseum. You can learn more by reading the Department of Cultural Affairs 2018 Festivals Guide. Forget the beach, the July 4th Pier Pressure Fireworks Cruise at Long Beach is Southern California’s biggest and best yacht party going on seven years, and the best way to catch a fireworks display right out on the open waters. Head out on the 350-person, 3-deck Catalina King Yacht, and you can enjoy those fireworks along with 2 spectacular live DJs, a bevy of fully-stacked bars, and a night of fun crowds. Remember to come dressed appropriately for this soiree, you’ll need to look sharp to gain entry to the yacht (and they will turn you away if you aren’t up to standards). You can learn more about the specifics of the dress code and find tickets on the event page linked above. The Palisades Americanism Parade Association is dedicated to making the Pacific Palisades Fourth of July Celebration “one of the finest in the Western United States.” It’ll be up to you to judge for yourself whether they’ve met their goals or not, but seeing as this event is entering its 70th year, there’s a good chance they’re doing something right. There are plenty of associated events going on in conjunction, but the one you’ll be most interested in is the Fireworks Spectacular, which takes place at 9PM. Be sure to check out their Facebook page to see some of the photos of the fireworks from previous years. If you’re in the mood for a potluck-style picnic 4th of July setting, you can find it at the Annual 4th of July Picnic & Fireworks Extravaganza taking place at Warner Center Park in Woodland Hills. The extravaganza will start around 4:00PM, and you’ll do well to arrive early as the park gets crowded fast (and seating becomes quite scarce). There will be board games, card games, frisbees thrown, and, what you really want to see — a fireworks show at around 9:00PM. The fireworks will be impressive, without a doubt. What you might find more impressive, though, is how fabulous those fireworks look when you’re in the inimitable atmosphere of grand apartment spaces like Atelier. This downtown community is one of DTLA’s most coveted, and for good reason. With a contemporary, “evolved” design sense and more top-tier resident amenities than you can shake a stick at, you could well find yourself making this home and never wanting to leave.